A competent, unique spin on the Rival line. 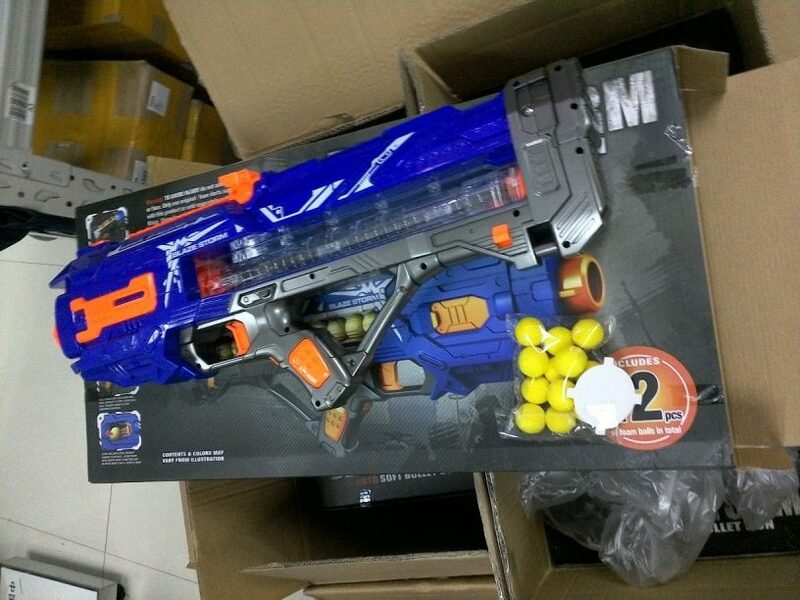 Chinese toy companies are known to produce their own versions of popular toy blasters, if not outright copies. One such company is Zecong Toys. Known mostly for the “Blaze Storm” series of blasters, they tend to put their own spin on products. In this case, they’ve copied the Rival Zeus. But does it stand up to the original? 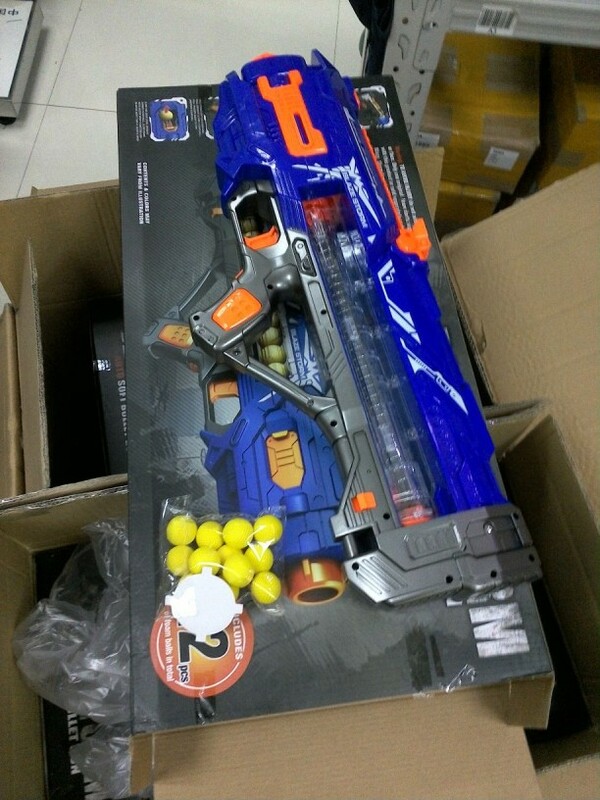 In the interest of full disclosure, I was one of a few people to import large quantities of these blasters from China, and will have them on sale again at some point when I’m not so busy. I’ll do my best to give an impartial opinion, though! The Blaze Storm Zeus (item zc7073) looks and feels different straight out of the box. It’s wider than the original, and the plastic is glossy and smooth to the touch. It has a solid feel, and isn’t cheaply constructed. Functionally, everything is the same, although slight differences in the parts also exist. The handle is extended in order to feature a complete thumb hole. The magazine retaining tab is wider than on the Zeus, and the plastic ridges on the magazine and where it sits are also slightly different. Different enough, in fact, to make the magazines incompatible with the regular versions. Shaving the plastic down solves the problem, but it is still an unfortunate oversight on the part of Zecong. Interestingly, the Zecong version doesn’t feature any of the Rival rails for attachments or magazine holders. Instead, it features a functional Picatinny rail. The user can use any sort of airsoft or firearm optics and accessories! Of course firearm optics are generally pointless for foam flinging endeavors, but it’s a nice touch in terms of aesthetics. Like the original, this blaster is powered by six “C” batteries, sitting in a removable tray. It also features the same safety switches, requiring a magazine to be present and the jam door to be closed before the motors will rev up. 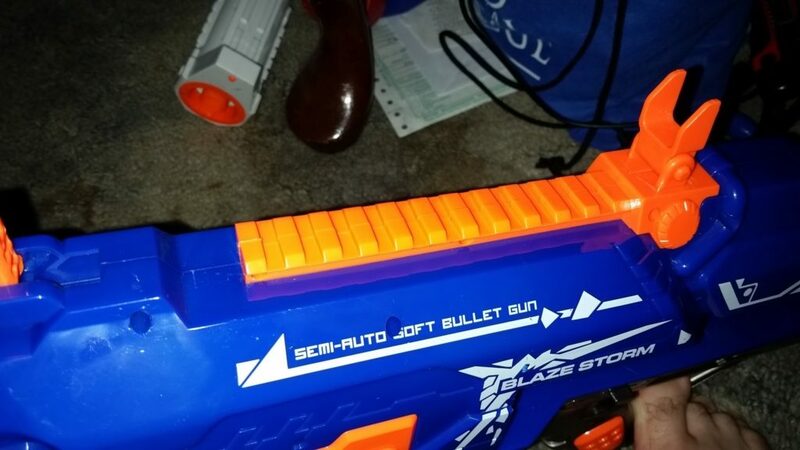 Quite frankly, this is the highest quality knockoff blaster I’ve seen to date. 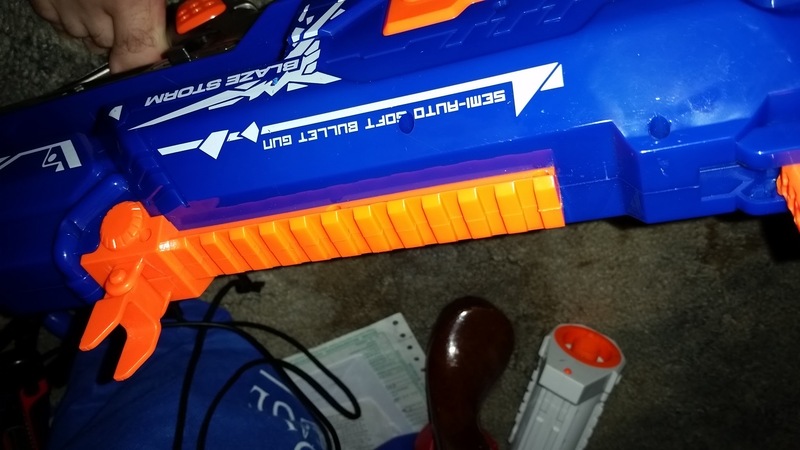 On the inside of the blaster is the usual setup for semiauto blasters. A rev trigger sits below the main trigger, and it completes the circuit for the flywheel motors. The main trigger pushes the next ball into the flywheel cage, while extending a tab to prevent the entire magazine from dumping out. Interestingly, there is no rubber flap inside the barrel for inducing spin in the balls. As a result, there is slightly less range. It’s a simple case of aerodynamics – having a certain amount of hop-up generates lift. The wider shell, meanwhile, actually makes this blaster easier to mod than the Zeus. Quite simply, there’s space. 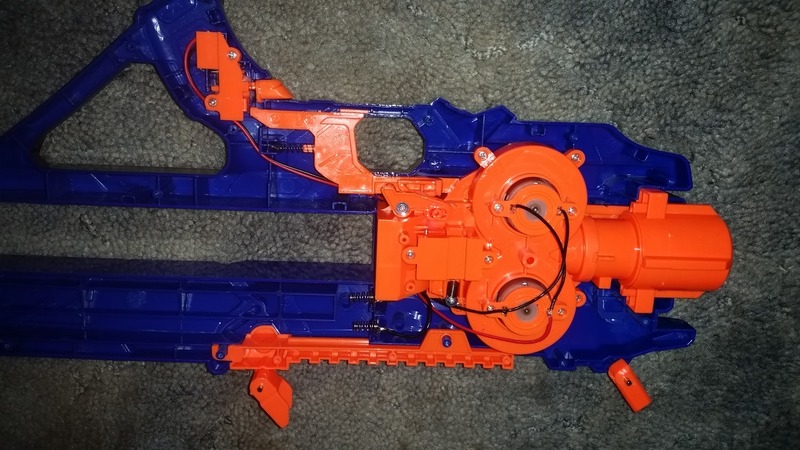 It’s a simple matter to stuff wire connectors in front of the motors, or to drop a MOSFET elsewhere in the blaster. If you’re new to modding electric blasters, there’s enough room in the stock to throw in an automotive relay – just wire the rev trigger to the switch side, and use the other terminals to dump current directly to the motors. As mentioned before, the lack of hop-up means that ranges are 5-10 feet less than the original Zeus blaster. 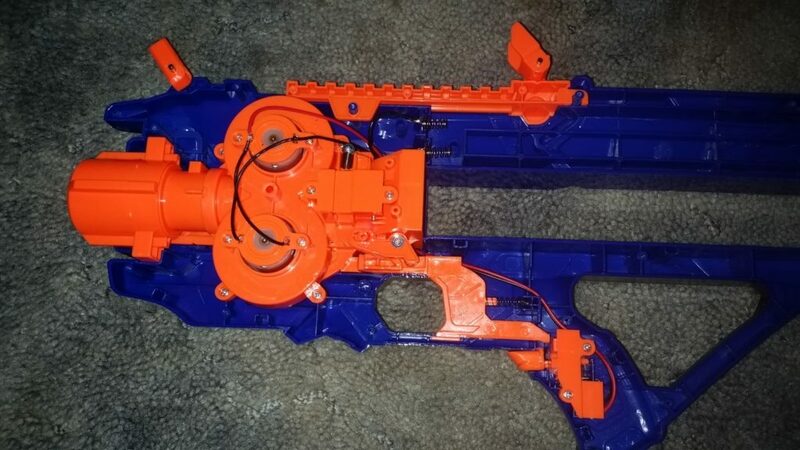 Otherwise, the blaster behaves similarly, down to the time it takes for the motors to rev back up after firing a ball. Modding, of course, will change the results significantly. Reloading, however, will still be an issue without extra magazines; you really shouldn’t have to modify a blaster just to add compatibility that should’ve been there in the first place. 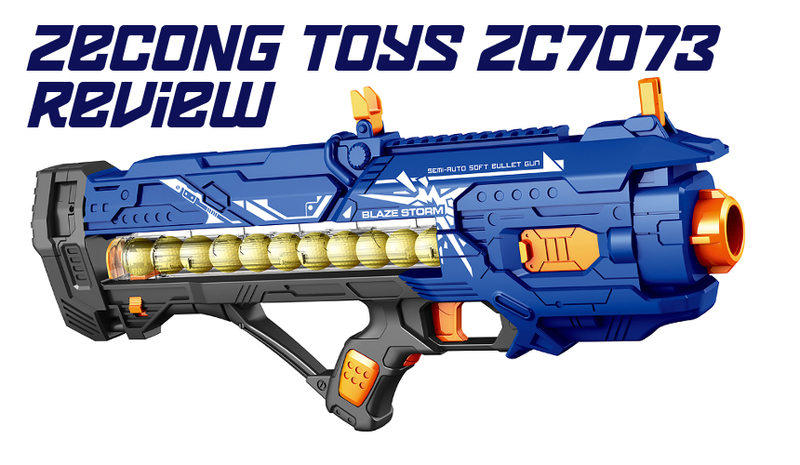 The Zecong zc7073 is one of the best blaster clones to date, with performance similar to the original (if slightly inferior) and an attractive shell. It’s hard to find in the United States, although it can be found with some difficulty on Taobao and similar websites. Should you get one? It really comes down to whether you want a unique item or not. For most anyone, a Zeus will be just fine. Of course, why buy a Zeus when you could get a Khaos or (very soon) a Nemesis? This entry was posted in Dart Blasters, Reviews and tagged review, rival, Zecong on May 1, 2017 by BuffdaddyNerf. How much will you be selling them for? In your review, you say that the Zecong magazines aren’t compatible with a regular Nerf Zeus, don’t you ? 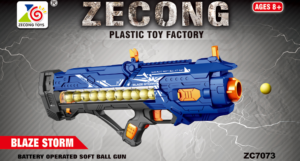 But are the Nerf Zeus magazines compatible on the Zecong blaster ? Are you still planning on selling these?